Established in 1988, BISE Faisalabad is the intermediate education governmental body in Faisalabad Division with its jurisdiction over districts including Faisalabad, Chiniot, Toba Tek Singh and Jhang. The building of the board is located on Jhang road near Faisalabad International Airport. 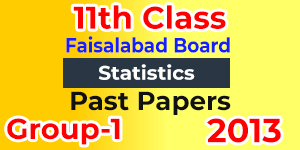 The board conducts the exam of Matriculation and Intermediate in the month of March and April and results are announced in July and August. There are candidates of FSc, F.A and I.Com who just get into a new academic phase after passing their matriculation. This phase is quite new and the students of 11th class usually get confused about the paper pattern and exams and they need guidance in the form of past papers of 11th class. 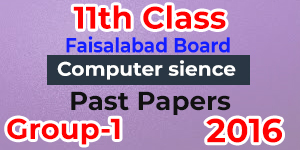 The past papers of FSc part 1, F.A part 1 and I.Com part 1 are uploaded and updated here on regular bases so that the candidates could get them downloaded for a better preparation of their exams.